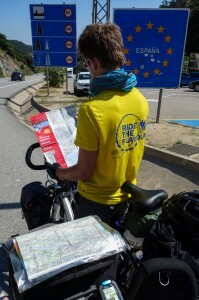 Compass and maps, this is all what we have to follow our route map during this world tour. We already had the compass. And to help us to set up and find our way, our partner Michelin Guides et Cartes gave us the road maps of all the countries which we shall cross. Michelin Guides et Cartes marketed its first road maps in 1908, today their maps are known and recognized for their precision and their accuracy. Their wide range of map of France and the countries of the world, Michelin Guides et Cartes will help us never to lose our route. Huge thanks to Michelin Guides et Cartes for following and supporting the adventure Ride The Flavour!